Hill Prince was a Virginia-bred Thoroughbred that raced for Christopher Chenery’s Meadow Stable in Virginia. 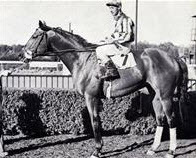 In 1950, Hill Prince participated in 15 races and won numerous of them, including Preakness Stakes, Wood Memorial Stakes, Withers Stakes, American Derby, Jockey Club Gold Cup, Jerome Handicap and Sunset Handicap. For these achievements, he was named American Horse of the Year. 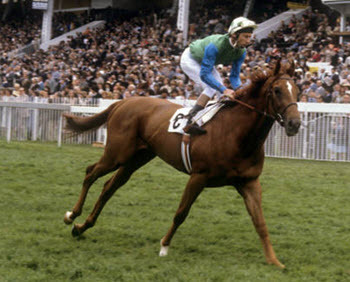 After his racing career, he was kept at Meadow Stud as a breeding stallion. When he died in 1970, at an age of 23 years, he was interred next to Sun Beau at the Meadow Stud property. In 1991, Hill Prince was inducted into the National Museum of Racing and Hall of Fame in New York. Hill Prince was a bay colored colt bred at Christopher Chenery’s Meadow Farm near Doswell, Virginia. Hill Prince belonged to one of the first crops of foals sired by Princequillo. Princequillo had been a very successful racehorse, but when Hill Prince was foaled it was still unclear if Princequillo would also go on to become a highly successful sire of racehorses. 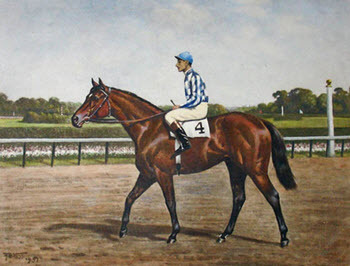 Hill Prince’s dam was named Hilldene, and she would eventually produce Fist Landing – the American Champion Two-Year-Old Colt of 1958 and third in the 1959 Kentucky Derby. Hilldene had been purchased by Christopher Chenery in 1939 for 750 USD and was the foundation mare for this horse breeding endevour. Christopher Chenery (1886-1973) was born in Richmond, Virginia and raised in Ashland, Virgina. He was a prominent horse breeder and one of the founders of the New York Racing Association. In 1936, Chenery purchased The Meadow property near his childhood home in Ashland. At The Meadow, he founded the Meadow Stud (for breeding Thoroughbreds) and the Meadow Stable (for racing Thoroughbreds). One of Chenery’s famous race horses was the U.S. Triple Crown champion Secretariat. He also owned Cicada, who was once the world’s leading money winner among mares. As a two-year-old, Hill Prince entered the racing world with a bang by winning six of his first seven races. After his victory at the Cowdin Stakes at Aqueduct Race Track in September, Hill Prince was generally regarded as one of the season’s most promising juveniles. He managed to work his way from last place on a muddy and difficult track to bag not just a two and a half length victory against Selector, but also a new track record time of 1:16.6. As 1949 draw to a close, Prince Hill was voted American Champion Two-Year-Old Colt in the Daily Racing Form poll. Hill Prince opened his three-year-old season by winning the Experimental Handicap No. 1 at Jamaica, strengthening his position as one of the main contenders for the Triple Crown. The Experimental Handicap No. 2 at Jamaica was a disappointment however, with Hill Prince finishing 9th. Less than a week after No. 2, Hill Prince was in much better shape and secured a two-length win over a strong field in the Wood Memorial. In the Kentucky Derby, a Hill Prince ridden by Eddie Arcaro became runner-up after Middleground. A week later, it was Middleground’s turn to be beaten by Hill Prince in the Withers Stakes at Belmont. In the next race – the Preakness Stakes – Hill Prince once again beat Middleground, and this time by a margin of five lengths. Jerome Handicap September Stayed towards the back in the early stages, and carried out a superb run in the straight. Sunset Handicap Stayed towards the back in the early stages, then overtook the field – including the champion Next Move – in the closing stages. In the Suburban Handicap, which took place soon after Preakness Stakes, Hill Prince finished third after being matched against older horses. According to some reports, he was bleeding from his nostrils at the finish. Other examples of races in 1950 where Hill Prince didn’t win was the Belmont Stakes (finished 7th), Dwyer Stakes (finished 2nd) and Thanksgiving Day Handicap (beaten in a photo finish). In his penultimate race of the year, the Hollywood Gold Cup in California, he finished third. In January 1951, Hill Prince was injured during preparations for the Santa Anita Maturity. A bone broke in his right hind leg and he needed to take a long break to recover, missing the first eight months of his season as a four-year-old. In September, Hill Prince was deemed sufficiently healed to participate and an allowance race at the Aqueduct Race Track, where he finished third. After the relative success at Aqueduct, Hill Prince was entered into the New York Handicap at Belmont where he carried top weight and still managed to secure a victory with a five length margin to the runner-up. Hill Prince then went on to finish second in the Jockey Club Gold Cup, where he was just narrowly bested by Counterpoint. A week later, he finished 4th in the Trenton Handicap. All in all, Hill Prince had made a successful comeback after his injury, and was voted 1951’s Handicap Horse of the Year in the Daily Racing Form and Thoroughbred Racing Association polls. Hill Prince won the San Marcos Handicap at Santa Anita in February. He was the favorite for the Santa Anita Handicap, but finished in 5th place. After the Santa Anita Handicap, Hill Prince was examined medically and “filling” was discovered in his right foreleg. He was therefore retired from racing. After his racing career, Hill Prince became a breeding stallion at the Claiborne Farm in Kentucky. Claiborne Farm was established in 1910 by Arthus B. Hancock, the owner of Ellerslie Farm in Albemarle County, Virginia, and has been run by members of his family ever since. At Claiborne Farm, Hill Prince sired 23 stakes race winners, including the 1957 American Champion Three-Year-Old Filly Bayou. Other examples of his offspring are the Coaching Club American Oaks winner Levee and the Gardenia Stakes winner Pepperwood. 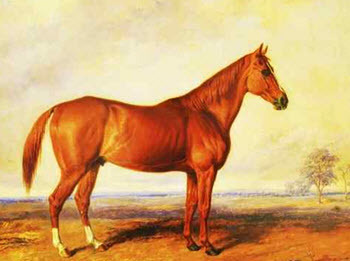 As the sire of broodmares, Hill Prince became the damsire of Shuvee and Dark Mirage – both inducted into the Hall of Fame at the National Museum of Racing.